Rochester, Minnesota — We returned to Decorah, Iowa, today to measure and sample the Decorah Shale (Upper Ordovician) in its type locality. It was much drier here than on our last attempt! Above is the gray Decorah Shale topped by the brown Cummingsville Formation. 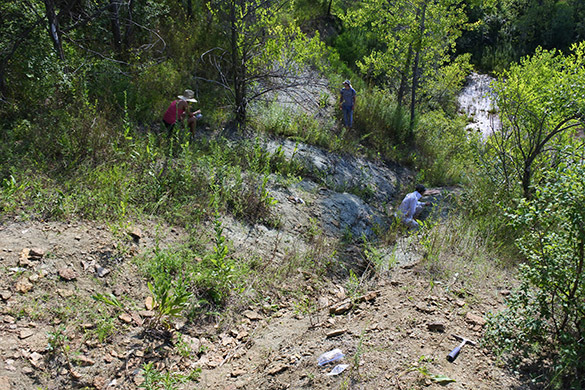 We started below the quarry exposure along the road to get the top of the Platteville Formation. This is the main locality for Dean Thomas (above) who is sampling these three units for conodonts and their associated carbonate petrographic facies. 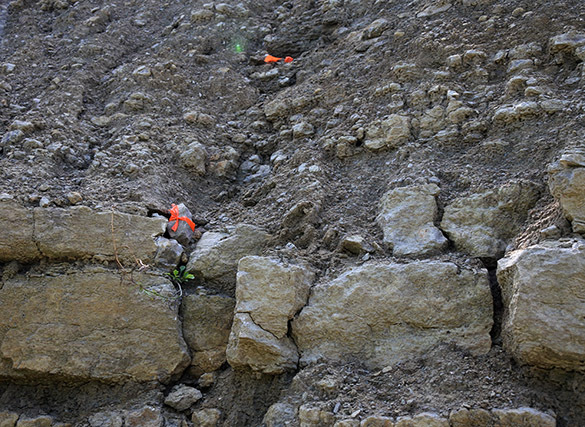 You may see tiny red ribbons on the outcrop that mark where we removed small blocks of limestone for lab analysis back in Wooster. 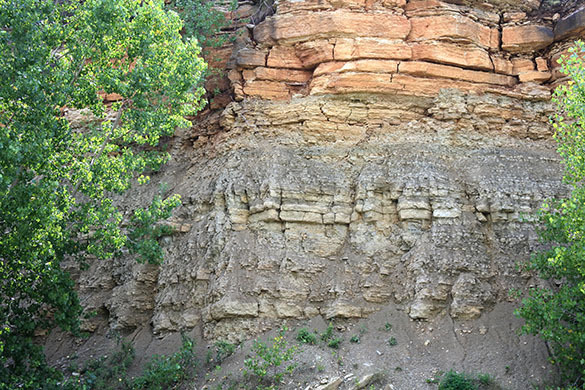 Here are some of Dean’s sampled strata in the Decorah. He also collected a few samples from the base of the overlying Cummingsville. 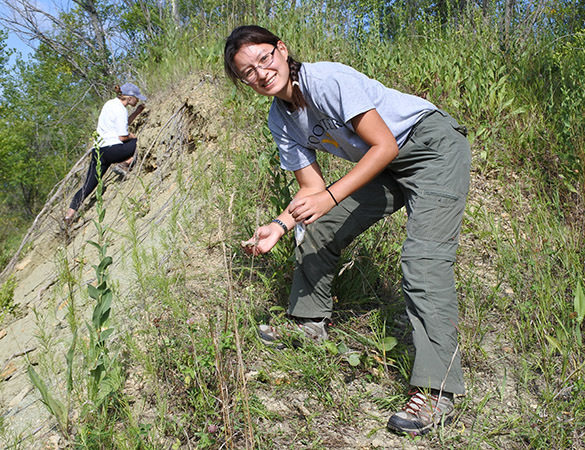 While Dean measured section and took samples, Etienne Fang (pictured), Rachel Wetzel and Nikki Bell worked through the Decorah Shale collecting fossils, with special concentration on the beautiful “gumdrop” bryozoan Prasopora. It was a sunny day, so we took shade where we could find it! At the end of the day we explored the richly-fossiliferous Cummingsville in blocks fallen from the face of the old quarry wall. 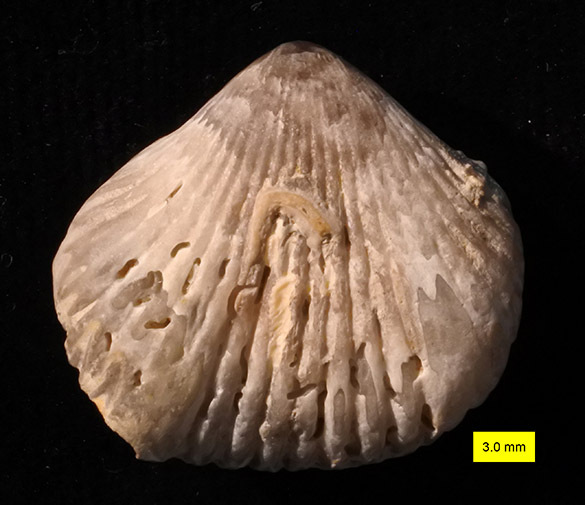 The Cummingsville is rich with both body fossils (brachiopods, crinoids, gastropods, bryozoans, especially) and trace fossils. A future Senior IS project? 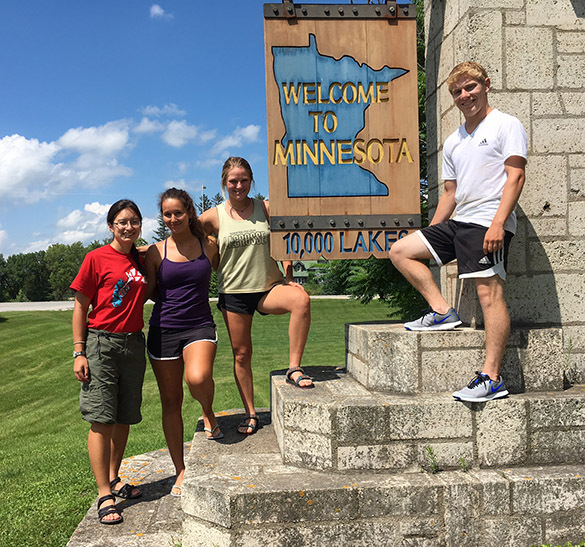 Team Minnesota has now completed its fieldwork! From the left, Etienne Fang (Bethesda, Maryland), Nikki Bell (Santa Monica, California), Rachel Wetzel (Sewickley, Pennsylvania) and Dean Thomas (Montpelier, Virginia). These students did fine work, setting themselves up for several months of lab analyses back in Wooster. I’m proud of this group! We still have a couple of days in Minnesota before the students fly to their homes and Nick Wiesenberg and I make the long drive back to Wooster with our samples and equipment. We plan to see the geological and historical sights within range of Rochester, which will, of course, be duly reported here. 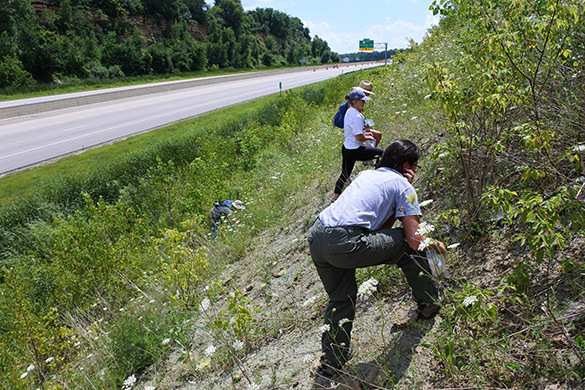 Rochester, Minnesota — Today we started collecting specimens and data for the Team Minnesota student Independent Study projects. 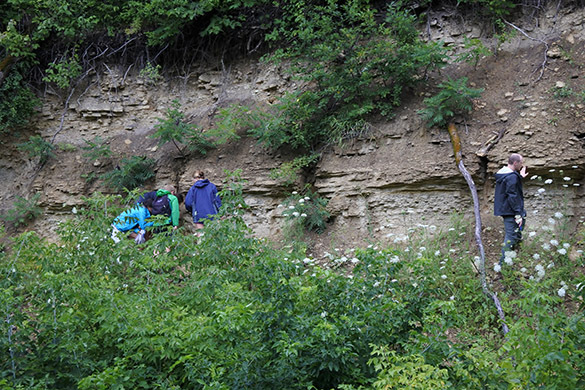 We began with a long drive south to Decorah, Iowa, to measure a thick section of our Upper Ordovician target units at the Decorah-Bruening Quarry (N 43.29036°, W 91.76558°), but a patch of persistent and heavy rain lingered over the area all morning. We gave up and headed back north to the Rochester, Minnesota, region, where it was dry and sunny. 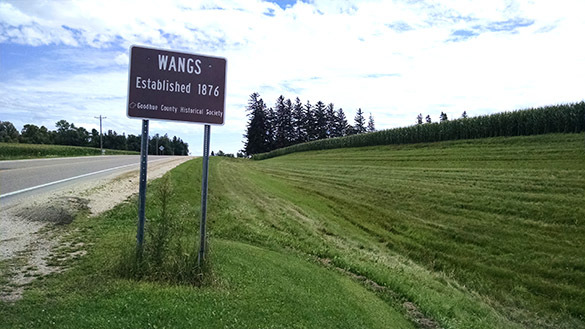 Our first stop was at Wangs Corner (N 44.41047°, W 92.98338°) to collect fossils from the Decorah Formation for a taxonomic and paleoecological assessment. Rachel Wetzel and Nikki Bell are the Team Paleontologists for this work. 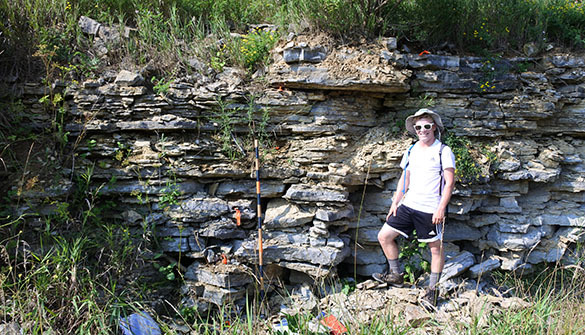 Dean Thomas has a role at this outcrop as well. 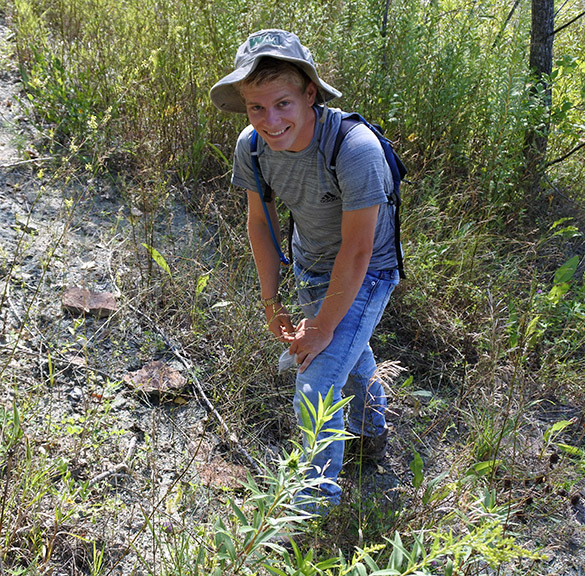 He will be doing a conodont biostratigraphy and paleoenvironmental study of the Decorah and units above and below. 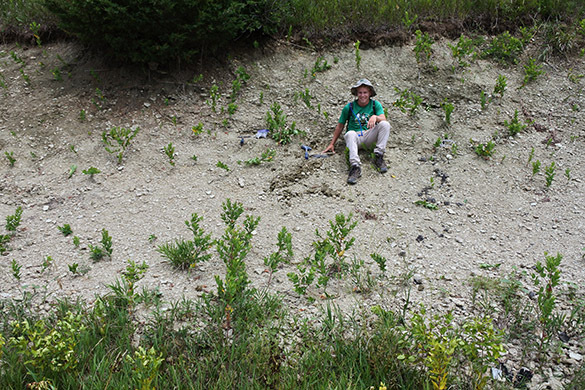 At Wang’s Corner he found a thin biosparite bed in the midst of the calcareous shale that he can use to help stratigraphically position this section of the Decorah, which has no visible upper or lower contacts. This bed is a beautiful nearly pure, coarse, well-cemented biosparite/grainstone in contrast to the argillaceous beds above and below. The orange patches in the top of the rock are burrows (likely Thalassinoides) filled with sediment from above. The traditional interpretation of these units is that they were formed by storms. Why they are so clay-poor is a mystery. Our last stop was the Turkey Run locality (N 44.38441°, W 92.91199°). Here the Decorah Formation is just barely exposed through the weeds. The students gamely collected fossils as the bright sun made us forget the disappointing morning rain. 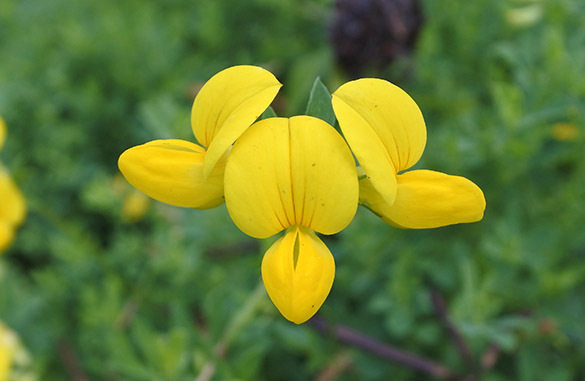 You’ve got to love a job where you can coin a name like Zigzagopora wigleyensis. 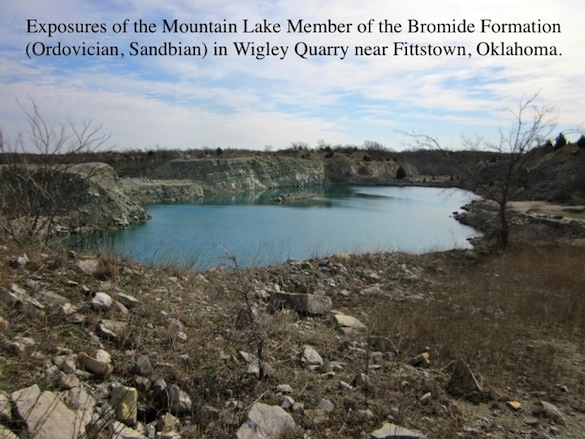 The fortuitous species name, by the way, refers to the Wigley Quarry in Oklahoma (below). This is what we mean by a “uniserial, geniculate arrangement of monomorphic zooids that bud alternately left and right”. 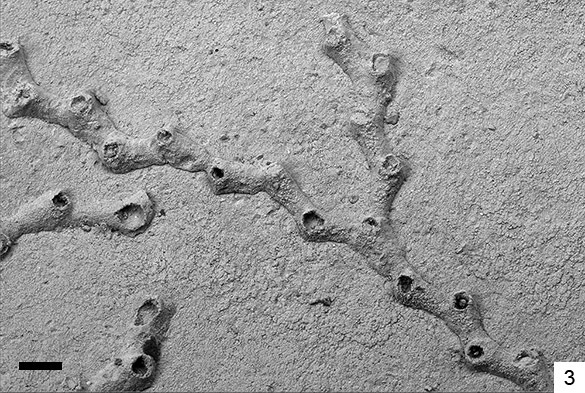 The zooids are the little skeletal tubes, each of which housed an individual bryozoan connected by soft tissue to the rest of the colony. 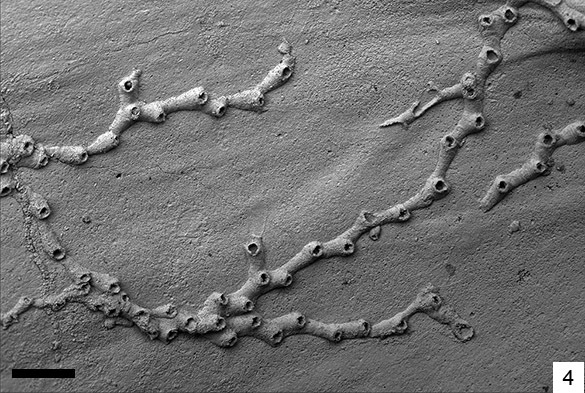 Uniserial means that most series of zooids have just one branching from another. Geniculate means “bent abruptly” like a knee joint. Monomorphic refers to the shape of each zooid being about the same. The scale bar is 0.20 mm. It is this zig-zag shape that makes Zigzagopora distinctive. Scale bar is 0.10 mm. 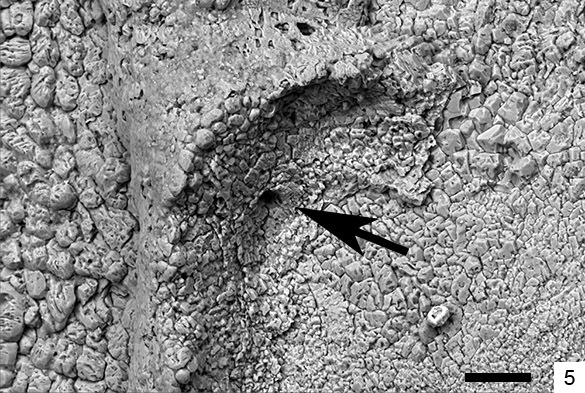 The abstract ends with “… superficial similarities with the corynotrypid cyclostomes with which it co-occurs.” In this scene Zigzagopora (Z) has overgrown a branch of the encrusting cyclostome bryozoan Corynotrypa (C). These bryozoans are obviously similar, but the geniculate (our new word!) nature of Zigzagopora sets it apart. This is significant beyond just the shape of the colony: it indicates a different kind of budding of one zooid from another. The scale bar is 0.20 mm. All bryozoans start from an initial zooid called the ancestrula. It is not always easy to find, but is critical for identification and systematics. 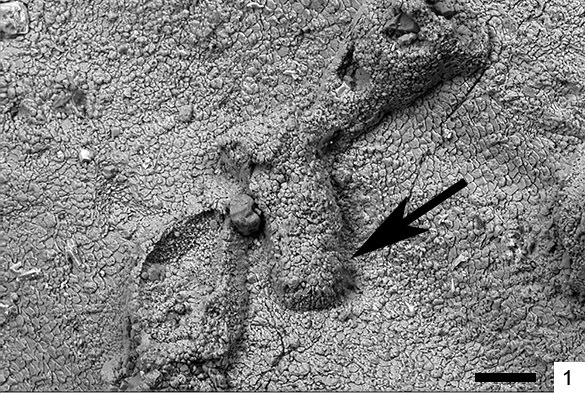 The arrow points to the protoecium, the first chamber. The scale bar is 0.06 mm. Inside a broken zooid we can see an interior wall surface and a tiny pore. Really tiny. 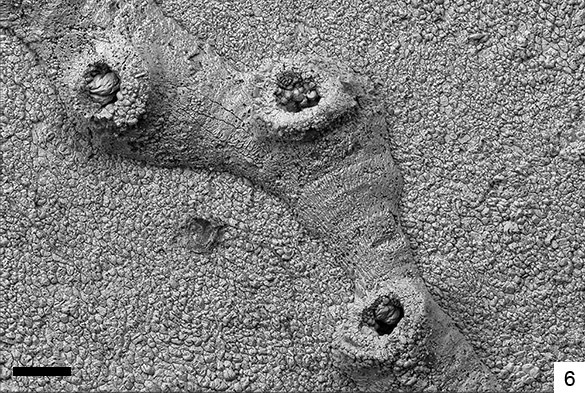 This is likely an interzooidal pore connecting the soft parts of the zooids. Scale bar is 0.03 mm. Here, then, is Zigzagopora wigleyensis, new to science. 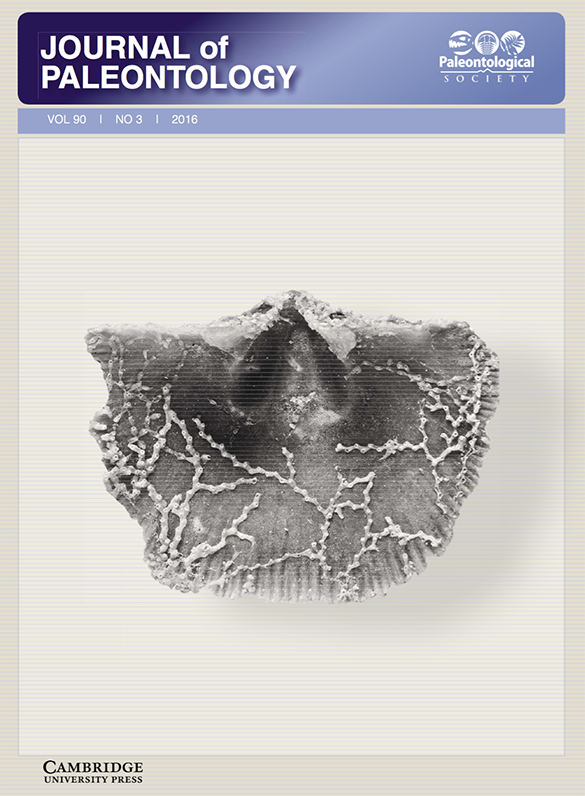 It is a tiny new piece for the puzzle that is the evolution of cyclostome bryozoans. It is one of countless billions of species in the history of life, but unique nonetheless. 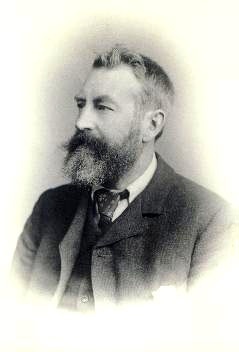 Taylor, P.D. and Wilson, M.A. 1994. 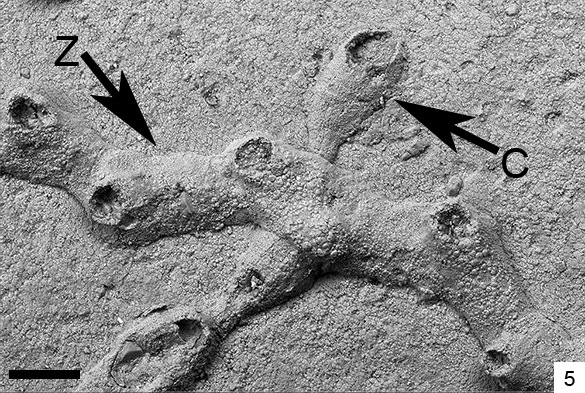 Corynotrypa from the Ordovician of North America: colony form in a primitive stenolaemate bryozoan: Journal of Paleontology 68: 241–257. Wilson, M.A. and Taylor, P.D. 2016. 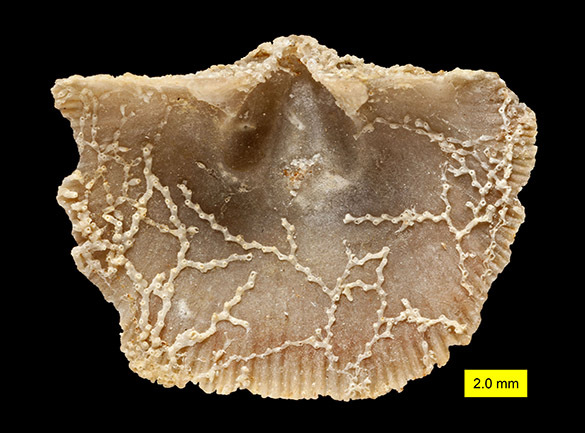 A new runner-like cyclostome bryozoan from the Bromide Formation (Sandbian, Upper Ordovician) of Oklahoma and its phylogenetic affinities. Journal of Paleontology 90: 413-417. UPDATE: Zigzagopora wigleyensis made the cover! Today was our last day with our expert guide from the Minnesota Geological Survey (and Wooster Geology alumnus) Andrew Retzler. 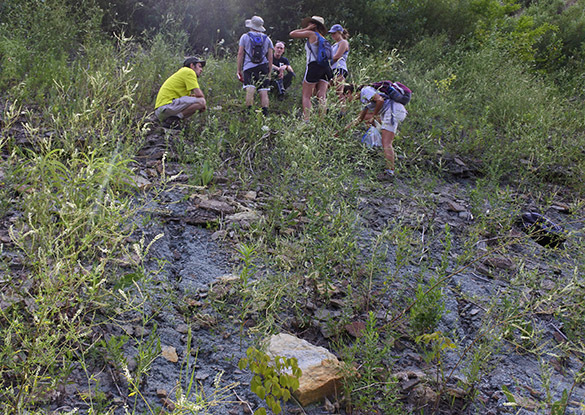 We visited three locations where the Decorah Formation is exposed. The top image is us on an abandoned slope of a quarry near Rochester. 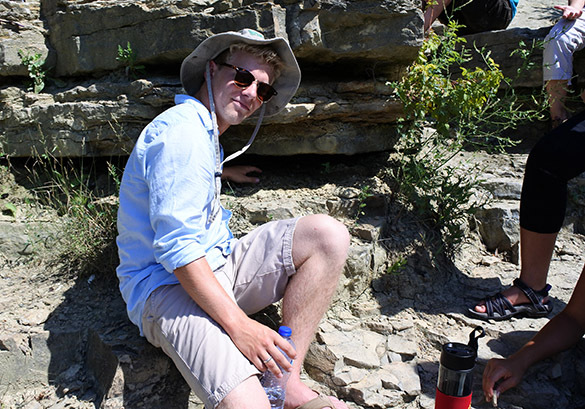 Andrew is enjoying the many fossils in the Decorah at this site. Note the thin carbonate slabs that weather out of the shale. Turkey Run was our second site of the day. 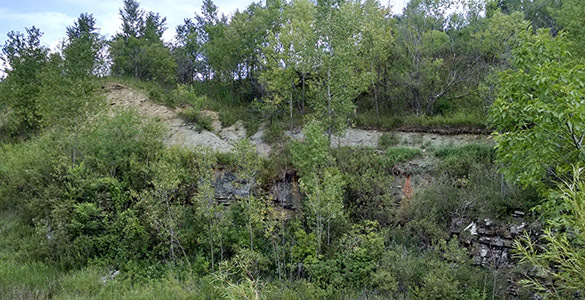 The Decorah and lower part of the Cummingsville Formation are exposed here. We needed a machete! 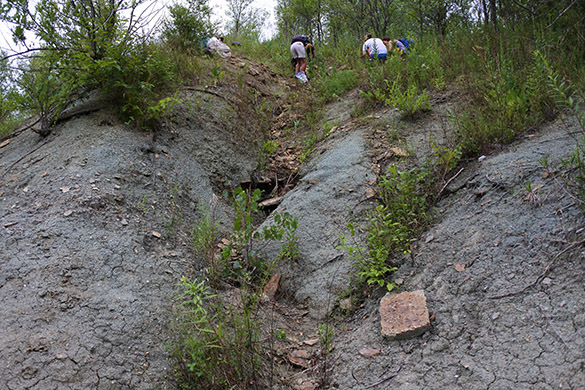 The students are examining the Decorah shales on the left. 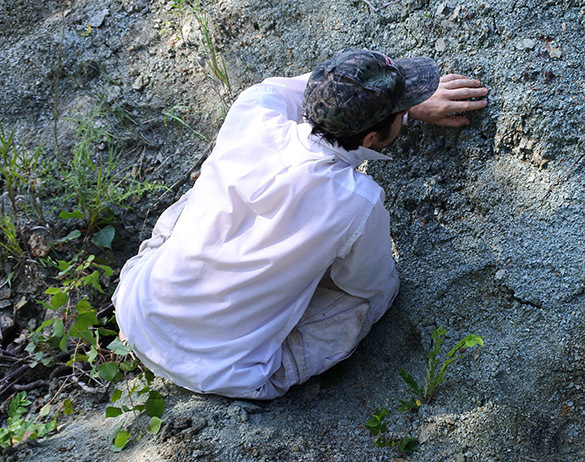 Andrew is on the right with his hand on the base of the Cummingsville Formation. Wang’s Corner was our third and last stop of the day. This exposure of the Decorah was right on the side of the road, making it the easiest outcrop yet. While we worked, Nick Wiesenberg on the left made us delicious salmon and cheese cracker snacks. That was a new field trip experience for me: fine dining while collecting! 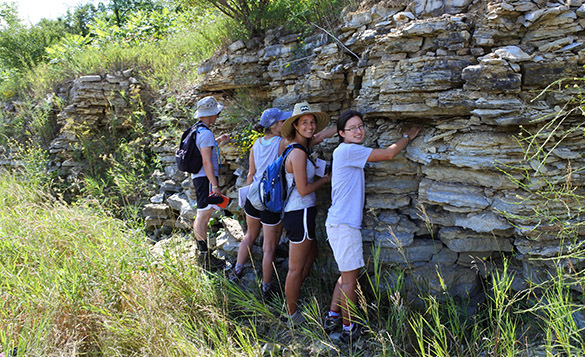 Here we are in Hernke’s Rock Quarry with the Shakopee Formation, part of the Prairie du Chien Group (Early Ordovician). All is thus well with Team Minnesota as Andrew Retzler leaves us and we’re on our own. We have four student projects we’ll outline here over the next few days. The temperatures dropped as a front moved through, so we had a cool, drizzly day. Tomorrow we return to Iowa. 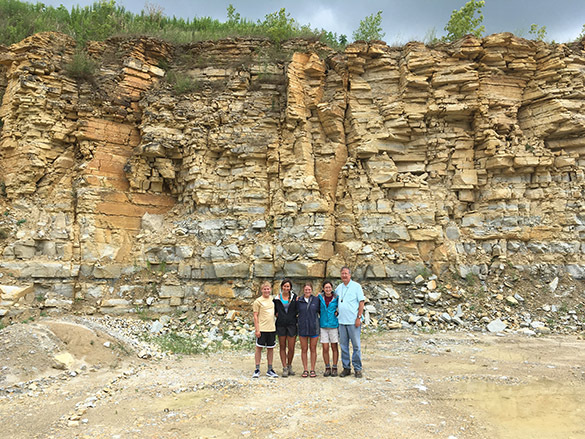 Rochester, Minnesota — Team Minnesota traveled south today to visit exposures of our three favorite formations: the Platteville Limestone, Decorah Shale, and Cummingsville Limestone. 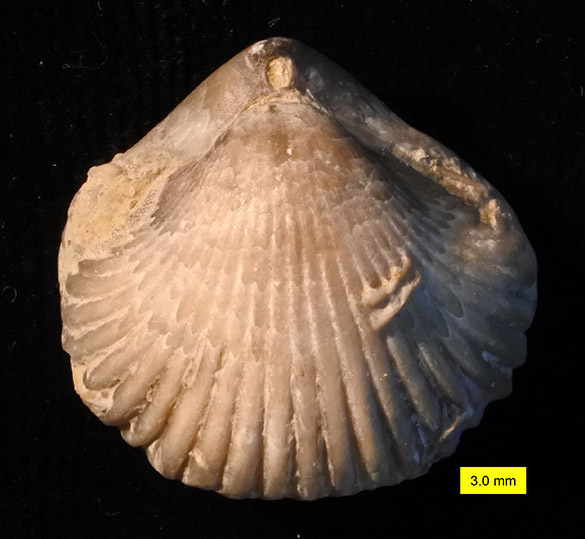 Where best to see the Decorah Shale than in Decorah, Iowa? 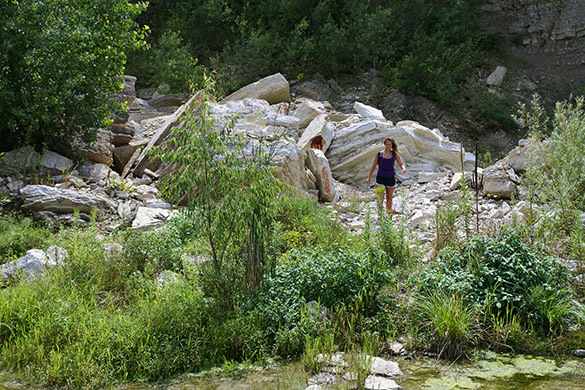 Above the crew is scattered in the abandoned Decorah Bruening Quarry. They are walkinng on top of the Carimona Member of the Decorah, with the shaley units above topped by the Cummingsville Limestone. We began at the bottom with the Platteville and a bit of rare shade. Nikki Bell and Etienne Fang have their hands on the iconic Deicke Bentonite. A very handy time indicator, that volcanic ash deposit. Our excellent guide Andrew Retzler of the Minnesota Geological Survey is examining the contact between the upper Decorah Shale and Lower Cummingsville Limestone. We found here several specimens of the “gumdrop” bryozoan Prasopora. 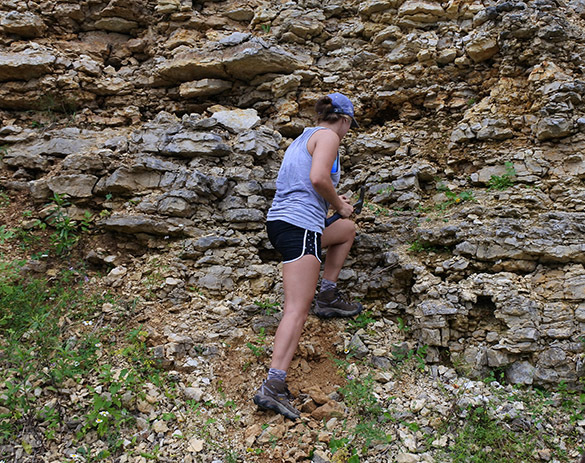 Rachel Wetzel gets a bit too close to the crumbly cliff of Cummingsville Limestone at the Decorah Bruening Quarry. Where freshly exposed, the Cummingsville reveals itself to be a fascinating unit with alternating limestone lithologies. 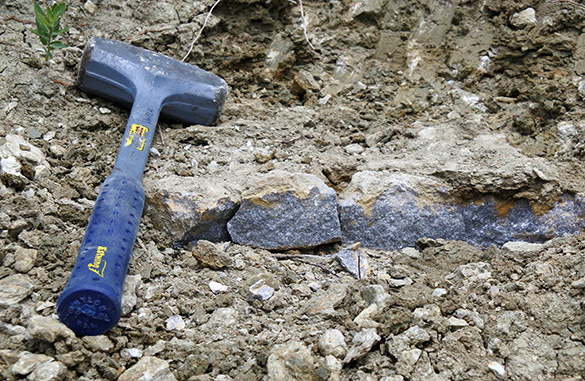 The darker layer here is a packstone with fine fossil debris. It is almost certainly a storm deposit. This slab of Cummingsville is covered with beautiful Chondrites trace fossils. 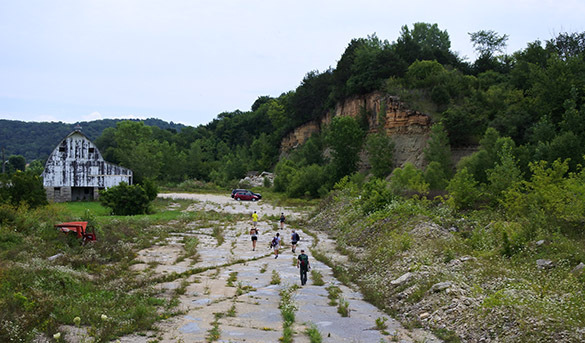 In the afternoon we returned to Minnesota and explored a very overgrown exposure of the Decorah Shale at the Golden Hill abandoned quarry along US 52 near Rochester. 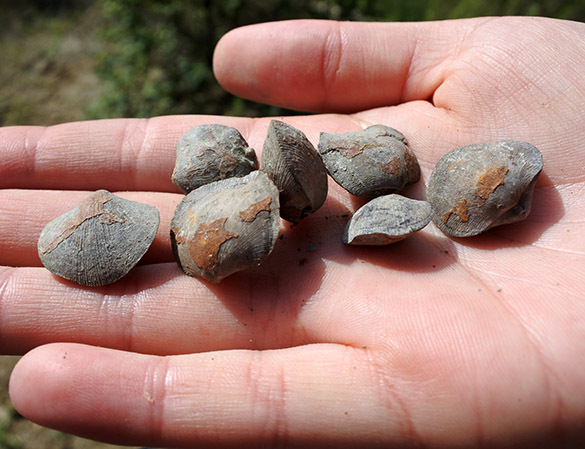 The main attraction here for us is the abundance of “iron ooids”, small spheres of iron oxides. Etienne Fang is studying their composition and origin for her Independent Study thesis. 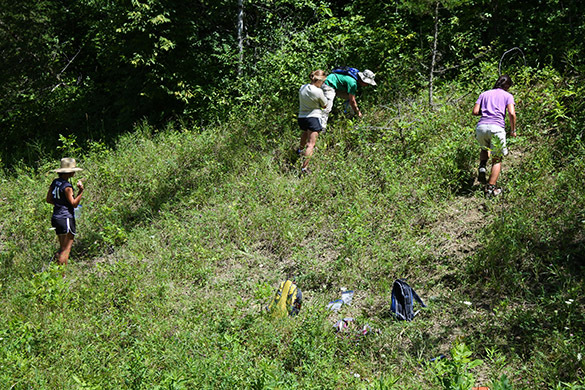 It’s a steep and muddy slope after a journey through head-high brush, but the bags full of samples made it worthwhile. The fossils here are gorgeous. 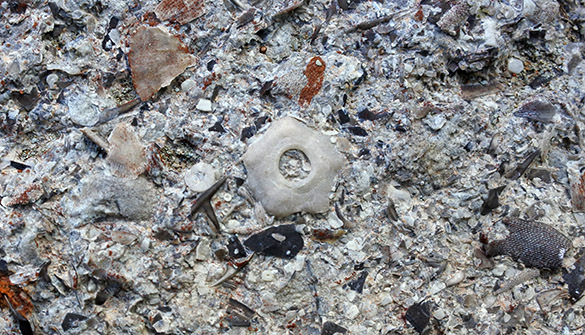 This is the base of a crinoid calyx surrounded by brachiopod, crinoid and bryozoan debris. It was a great day of exploration. 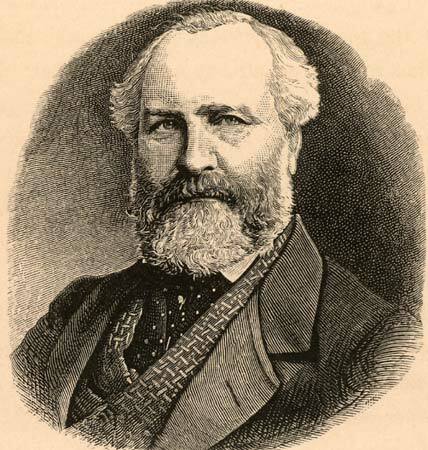 Tomorrow we examine localities north of Rochester. Rochester, Minnesota — The first Team Minnesota of Wooster Geologists has now gathered for its work in this beautiful state. 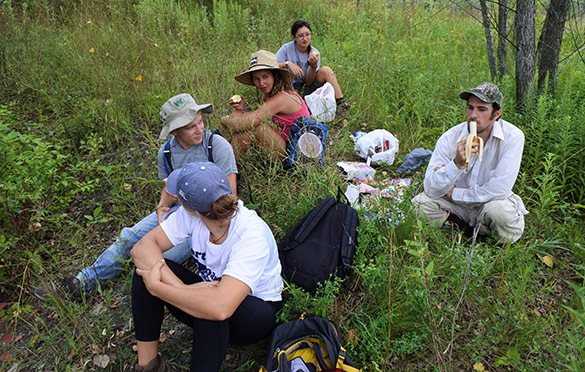 Above from the left is Rachel Wetzel (’17), Dean Thomas (’17), Nick Wiesenberg (Geological Technician), Nikki Bell (’17) and Etienne Fang (’17). 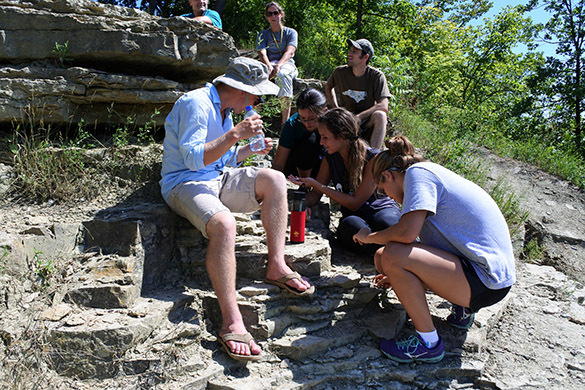 They’ve gathered from five states to pursue integrated Independent Study fieldwork in the Upper Ordovician Decorah Formation and related units. AS you can see, our first day was bright and warm. 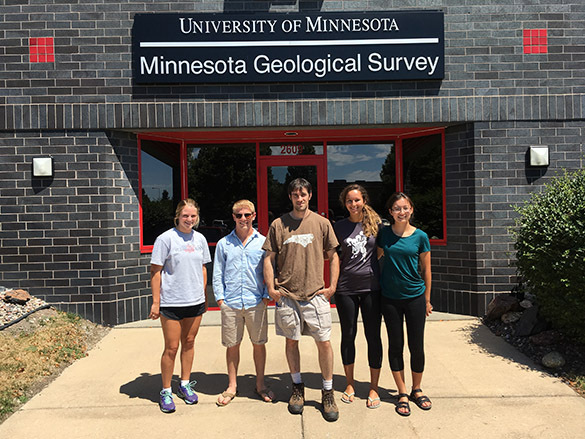 The team is in front of the headquarters of the Minnesota Geological Survey in St. Paul. It is a very earnest, hardworking place. 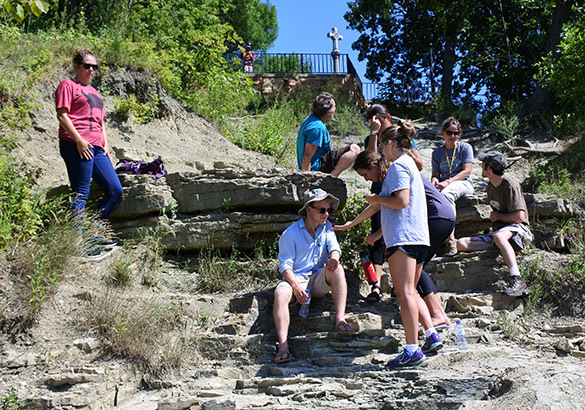 After sorting out car rentals, airport arrivals, and our first lunch, we met four geologists from the Minnesota Geological Survey (MGS) and drove to an outcrop a few miles south in St. Paul along the east bank of the Mississippi River. We are looking here at the group exploring the upper portion of the Platteville Limestone and the lower part of the Decorah Shale. Those four geologists from the MGS are an all-star team. 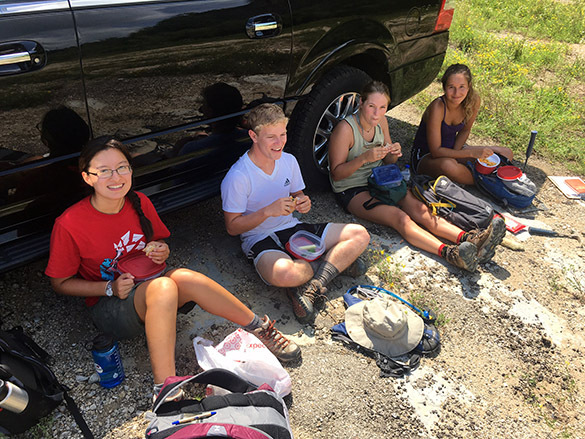 They included Tony Ruckel (Chief Geologist and Paleozoic Geologist), Julia Steenberg (Paleozoic Geologist), Jenn Horton (Quaternary Geologist and a Wooster Geology alumna), and Andrew Retzler (Paleozoic Geologist and another Wooster Geology alum). What a great scientific start. We learned much in just a few hours from their experiences with the Decorah Shale and associated units. Andrew will be our guide to the outcrops over the next couple of days. 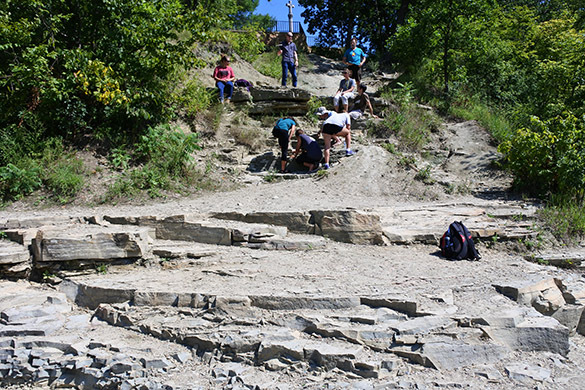 Examining the top of the Platteville Limestone at the Mississippi River Gorge Park site. Dean’s left hand is in a crevice where the famous Deicke Bentonite is exposed. This is a layer of altered volcanic ash from massive eruptions to the east associated with the Taconic Orogeny. These widespread ash layers make superb time lines in the rock record. Unfortunately we can’t see the actual clay because it was mined out by visiting geologists! The Mississippi River at our first outcrop. The rocks are Platteville Limestone. The Marshall Avenue Bridge is in the background. 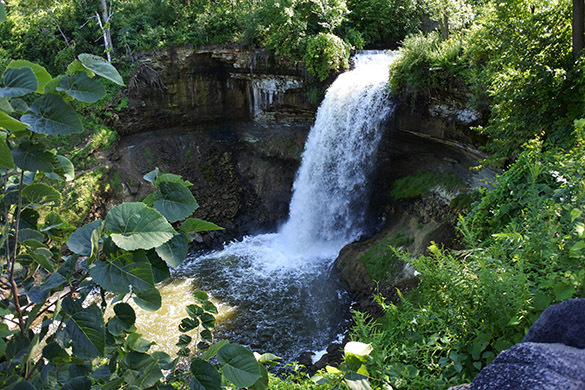 The last stop on this brief first day tour was Minnehaha Falls. The rocks exposed are, from the base, the St. Peter Sandstone, the Glenwood Shale, and the Platteville Limestone. After a delicious dinner in an outdoor restaurant in Minnehaha Park, we drove down to Rochester, which is our base of operations. We enjoyed meeting new friends and getting our first look at the rocks. 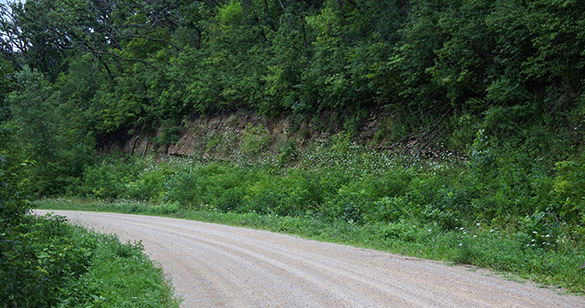 Tomorrow we begin a systematic survey of the Decorah outcrops in southeastern Minnesota and northern Iowa. 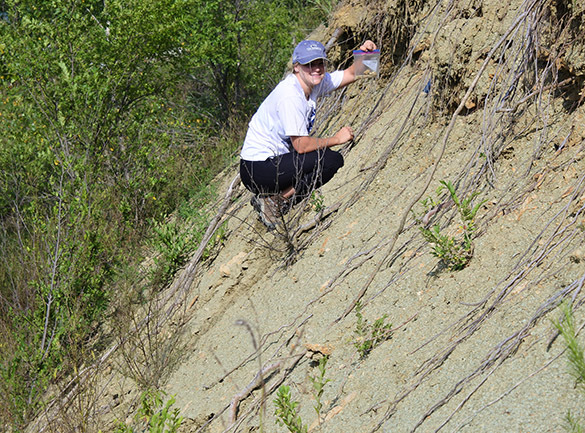 Cara Lembo (’17, Amherst) stands next to a ridge-parallel dike intruding through a tephra cone. Helgafell, a hyalocastite edifice, is in the distance. Undirhlíðar ridge on the Reykjanes Peninsula in southwest Iceland is a glaciovolcanic tindar formed by fissure eruptions under ice. Previous work in two quarries along the ridge shows that this specific tindar has had a complex eruption history. 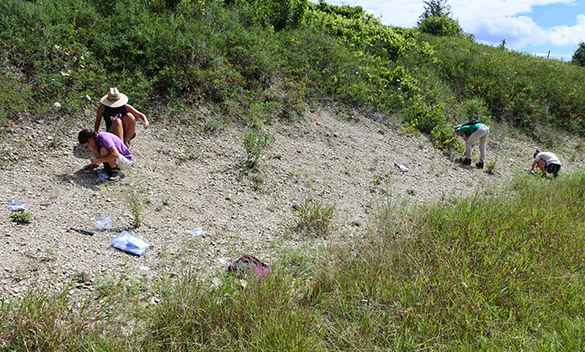 Here we report new results from investigations along the length of the ridge (~3 km) between the quarries. We have identified aerially significant fragmental deposits and a potential vent area on the ridge’s eastern side. The newly mapped tephra deposits are dominated by lapilli- and ash-size grains that are palagonitized to some degree (~20-60%) but locally contain up to ~75% fresh glass. Basal units are tuff breccia to volcanic breccia with basaltic and rare gabbroic lithic clasts. Upper units are finely bedded with few large clasts and some glassy bombs. 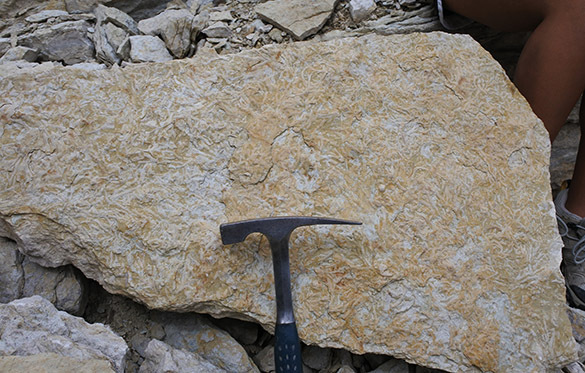 Locally, lapilli-tuff units show repetitive normally graded bedding and cross bedding. Measured bedding attitudes suggest that present exposures represent a moderately eroded tephra cone that was subsequently intruded by basaltic dikes. Extending north and south of the tephra cone, the upper surface of the ridge comprises pillow rubble with outcrops of massive basalts showing radial jointing and concentric vesicle patterns. All of the outcrops appear to be similar coarse-grained, olivine- and plagioclase-bearing basalts; ongoing petrographic and geochemical analysis will determine if the bodies represent “megapillows” or if they are related to intrusions that are present in both quarries. Along the western side of the ridge, lapilli tuff and/or volcaniclastic diamictites overlie pillow lava (or volcanic breccia made of pillow fragments) that is locally intruded by dikes. 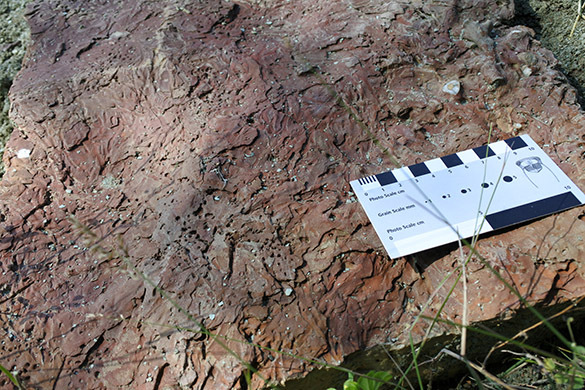 In northern gullies, at least two stratigraphically distinct units of pillow lava are present. In order to communicate the implications of our detailed research to a broad audience, we are constructing two “map tours” of the ridge: one that is centered on the abandoned and accessible Undirhlíðar quarry, and another that describes features along the upper part of the ridge between the quarries. 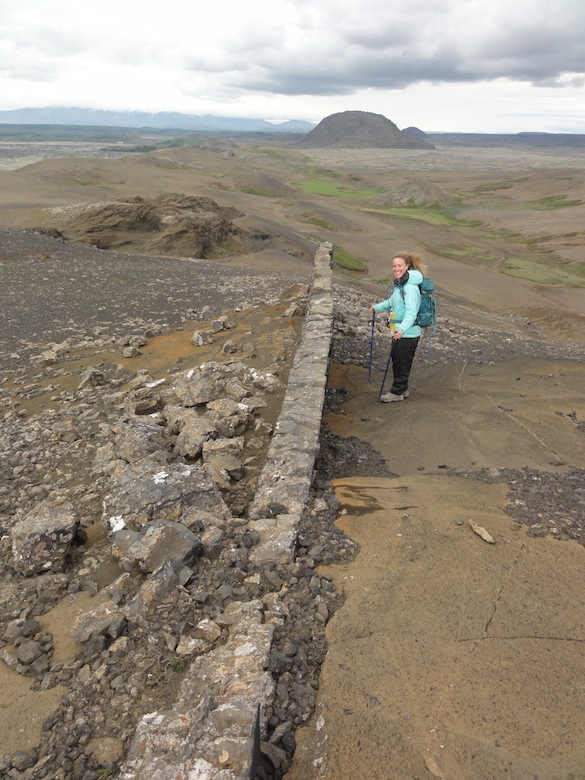 Stops along the tour include exposures of dikes, pillow lavas, and erosional alcoves within the tephra cone. The goal of these tours is to compare similar units across the ridge and quarry and to show the general anatomy of a glaciovolcanic ridge. 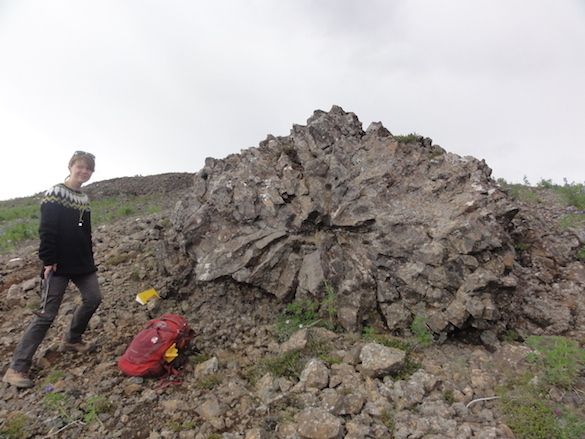 Cross section of a pillow lava, with Michelle Orden’s (’17, Dickinson) head for scale. 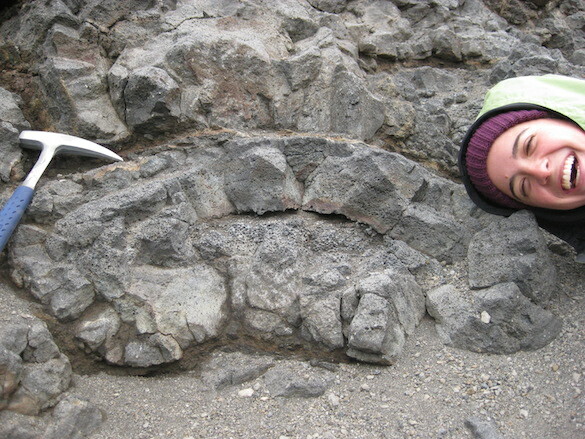 Pillow lavas are one of the most abundant lava morphologies on Earth, but are relatively inaccessible because of their submarine or subglacial eruption environments. 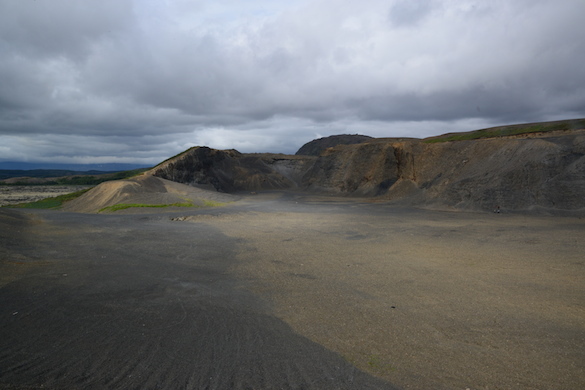 Our research location in a former rock quarry in southwest Iceland provides a unique opportunity to view cross-sections through well exposed pillow lavas on land. The quarry is located at the northern end of Undirhlíðar, which is a glaciovolcanic ridge on the Krisuvik fissure system, and exposes thousands of individual pillow lavas. This study uses detailed field and laboratory observations of vesicle distributions and jointing patterns to better constrain the mechanisms that control vesiculation, bubble transport, and cooling rates during emplacement of pillow lava. From detailed analysis of >40 exposed pillow cross sections, we have identified 7 fracture characteristics that make up a combination of fracture patterns within the pillow lavas. These characteristics include: short (<5 cm) fractures at the outer edge of a pillow, fractures within pillow cores, fractures between the core and the edge of a pillow, long fractures (up to 40 cm) that go through the entire pillow, ‘web’-like fractures, fractures that branch from other fractures, and curvilinear fractures that cut through bands of vesicles. The distributions of vesicles are more diverse, with at least 12 different patterns defined by characteristics including: concentric banding, moderately/highly vesicular cores, non-vesicular cores, and open cavities. We identified 6 vesicle pattern combinations in the field, and are using image analysis of nearly 50 field photographs to characterize the patterns. These characteristics will constrain physical modeling to better understand how variations in emplacement conditions (abrupt pressure changes, lava discharge rates, water infiltration along fractures) are recorded by the lavas. These pillow lavas are the only lasting record of a preexisting englacial lake presumably formed during the eruption of the lavas, so understanding the details of their textures may provide new insights into the hydrology of the enclosing ice (occurrence of syn-eruption jokulhlaups, efficiency of sub-ice drainage). Chloe Wallace (’17, Wooster) samples glassy pillow lava rinds for geochemical analysis by XRF and FTIR. Glaciovolcanic tindar ridges are landforms created by the eruption of magma through fissure swarms into ice. The cores of many of these ridges comprise basaltic pillow lava, so they serve an accessible analogue for effusive mid-oceanic ridge volcanism. Furthermore, similar landforms have been identified on Mars, and thus they may also serve as models for planetary volcanic eruptions. 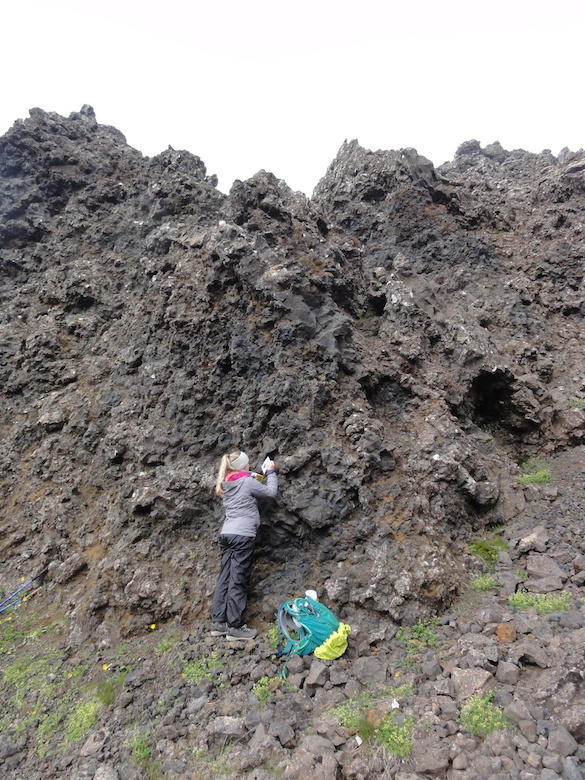 To better understand pillow formation and effusive glaciovolcanic eruptions, we are investigating Undirhlíðar ridge, a pillow-dominated tindar on the Reykjanes Peninsula in southwest Iceland. Our detailed mapping and sampling in two rock quarries along the ridge and in the ~3 km area between the quarries show that this specific tindar ridge has had a complex eruption history. 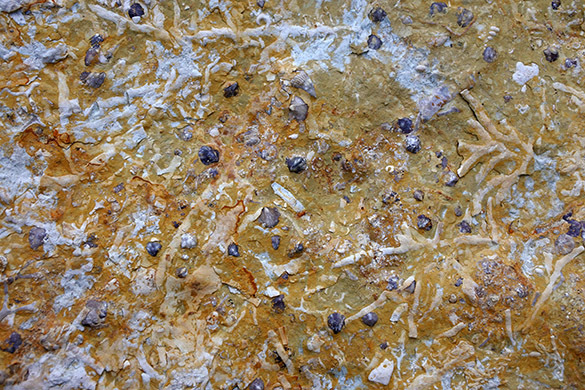 In the northern quarry (Undirhlíðar), Pollock et al. 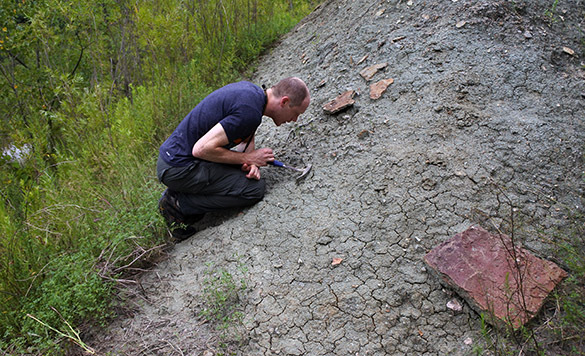 (2014) demonstrated that at least two geochemically distinct magma batches have erupted. Further trace element and isotope analyses in the southern quarry (Vatnsskarð) suggest that the ridge is fed by a heterogeneous mantle source. Isotopic Pb data show a spatially systematic linear array, which is consistent with a heterogeneous mantle mixing between depleted and enriched endmembers. The occurrence of multiple magma batches in dikes and irregular intrusions suggests that these structures are important to transporting magma within the volcanic edifice. Glassy pillow rinds were sampled for volatile analysis by FTIR in order to determine how paleo-water pressures vary along the ridge. In Undirhlíðar quarry, paleo-water pressures decrease with stratigraphic height (1.6-0.7 MPa). In Vatnsskarð quarry, paleo-water pressures show evidence of two separate eruptions, where pressure values decrease with an increase in stratigraphic height from 1.1 to 0.7 MPa over ~30 m, at which point pressure resets to 1.1 MPa and continues to decrease with elevation. When comparing the two quarries, paleo-water pressures in the upper units of Undirhlíðar and all the units in Vatnsskarð have similar values (0.7-1.1 MPa), and these are lower than the basal units of Undirhlíðar (1.2-1.6 MPa). 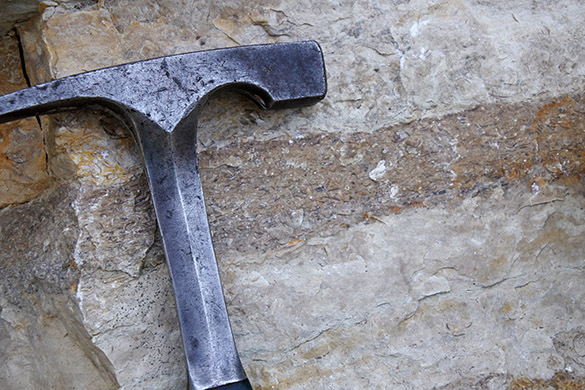 Overall, compositional variations correlate with stratigraphy and spatial distribution along axis, suggesting that glaciovolcanic eruptions and their resulting landforms show a higher level of complexity than previously thought. Documentation of the internal structures of volcanoes are critical for understanding how edifices are built over time, especially for glaciovolcanoes, which have rarely formed historically and are inaccessible during eruptions. We have been unraveling the internal structure of a complex glaciovolcanic ridge (tindar) in southwestern Iceland for the past 5 years in order to better understand the sequence of events that built the ridge. Undirhlidar ridge is ~5 km long, and has been dissected by two different aggregate mines along its axis. The northern mine (Undirhlidar quarry) is inactive and has walls up to 40 m in height that fully expose several critical stratigraphic relationships including multiple sequences of separate pillow lava flows, cross-cutting dikes that locally feed overlying pillow flows, and ridge parallel, continuous massive jointed basaltic units that may be the remnants of internal lava supply networks. The second quarry, ~3 km to the southwest (Vatnsskard quarry) is presently active and continually has new exposures. This quarry only penetrates halfway through the width of the ridge but has ~500 m of exposure along strike. It also has remnants of what appears to be the internal magma distributary system, and many components clearly show evidence that they were (and some still are) open lava tubes. While both quarries contain excellent exposures, many of the structures are difficult to safely access or are inaccessible due to mining activity. In order to overcome access issues, we have used Structure-from-Motion techniques to make 3-D maps of the quarry walls. A series of overlapping pictures were taken from points constrained with D-GPS using a Trimble GeoXH data logger and external antennae. The image locations with corrected positions were imported into Photoscan software to create a point cloud representative for each quarry and to derive a Digital Elevation Model with a reported vertical resolution of less than 1 m. Field testing of a preliminary, low resolution DEM shows that measurements of dyke widths on the DEM have errors of ~5% relative to measurements on the ground. Measurements made from the field-generated DEM will provide significantly better constraints on deposit thicknesses and volume estimates compared to traditional methods of estimating unit thicknesses on vertical faces. 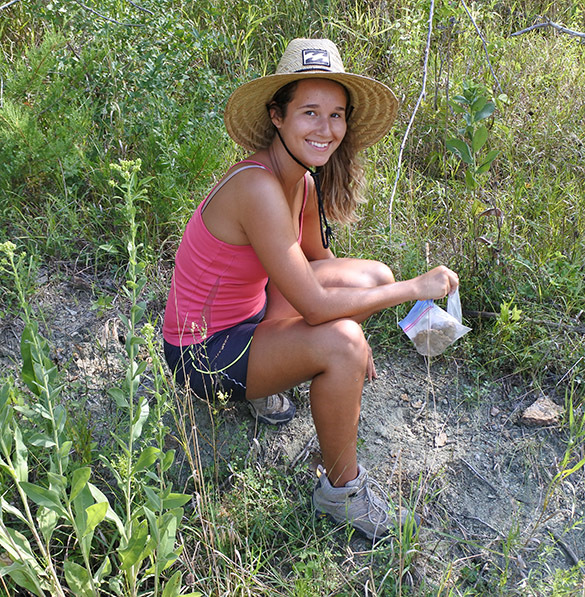 Wooster, OH – If you’ve been following our summer research adventures, you know that Amineh AlBashaireh (’18) has been hard at work studying the compositions of soils around abandoned mines in Black Mountain Open Space Park in San Diego, CA. She wrote the following abstract for the Geological Society of America Annual Meeting in Denver, Colorado this September. 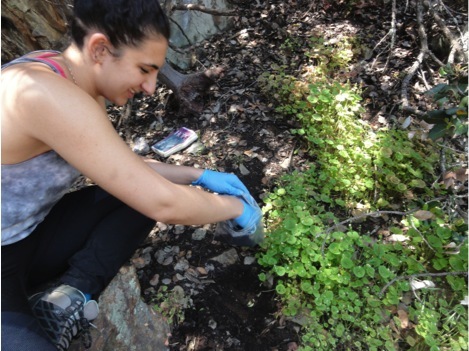 Amineh AlBashaireh (’18) collecting a soil sample surrounded by miner’s lettuce outside of Koala Mine in Black Mountain Open Space Park, San Diego, CA. Black Mountain Open Space Park in San Diego, CA is part of the Santiago Peak Volcanic Formation, a heterogeneous meta-volcanic unit that is locally ultra-enriched in arsenic (As). 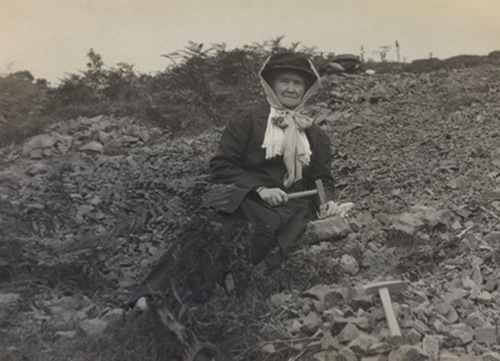 Small scale, artisanal-type As mining occurred during the early 1920s. Mines were abandoned with little documentation and no obvious remediation efforts. 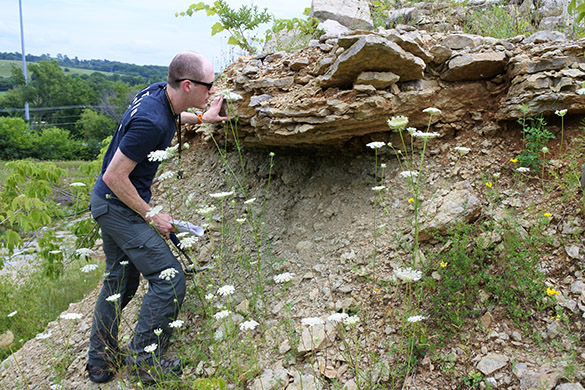 Initial field study by portable XRF yielded As concentrations up to 480,000 ppm in abandoned mines and rock outcrops throughout the park. This study is a first step towards understanding As fractionation in soils surrounding the mines. 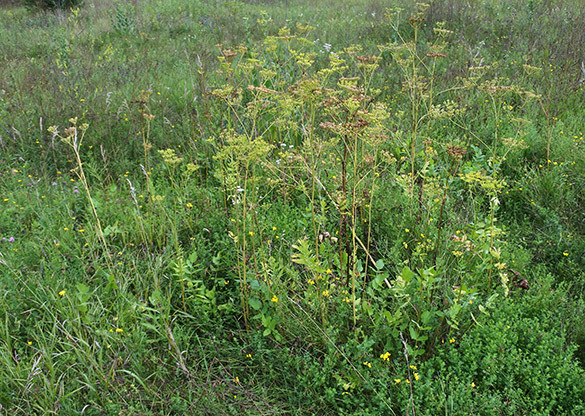 Twelve samples from the surface 5 cm of soil were collected in a ~48 m2 grid between two of the abandoned mines to determine how As concentration varies spatially, the degree of As mobilization during rain events, and how plants sequester As and affect soil As. Soils were pressed into pellets for analysis via WDXRF, and LOI was used to distinguish between organic and mineral-rich soils. To simulate transport by precipitation, 1:5 DI water leaches were performed on soils for 1 h, 24 h, and 7 day periods. Vegetation (miner’s lettuce, lemonade berry, and fern) was collected from the grid and will be analyzed by SEM-EDS for the extent of As throughout plant roots and bodies. While the crustal average for As is 1.5 ppm, soil concentration of As varies from hundreds of ppm to tens of thousands of ppm between the two mines. Consistent with hypotheses, the two greatest As concentrations occurred in rocky soils, possibly due to the presence of waste rock in the naturally occurring San Miguel-Exchequer rocky silt loam. Vegetation in the area appears healthy, but is not growing consistently across the grid, so SEM data will be compared with soil organic matter content and As concentration. San Diego’s semi-arid climate causes low precipitation and increased rates of soil erosion, making aeolian dispersion a likely mode of As transport. Consequently, there’s a potential health risk for those traveling off trail to visit the mines, hiking along the trails, and living in the canyon outlet. 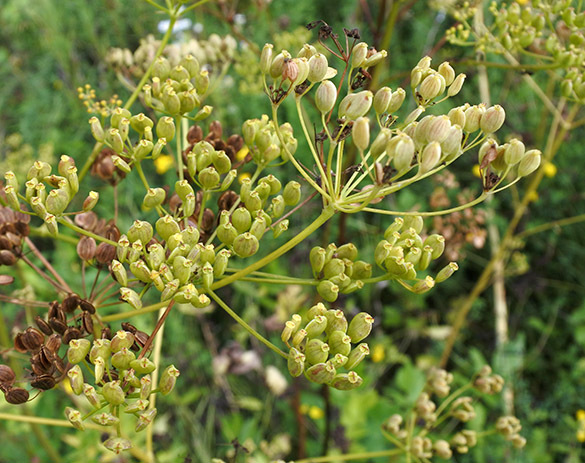 This is the first soil-plant arsenic study in a broader project aimed at understanding potential impact to public health. Additionally, this project has implications for the geologic occurrence of extreme As concentrations in igneous rocks from island arc settings. Filtration step of 24h deionized water leach on <1.0 mm Black Mountain soil. 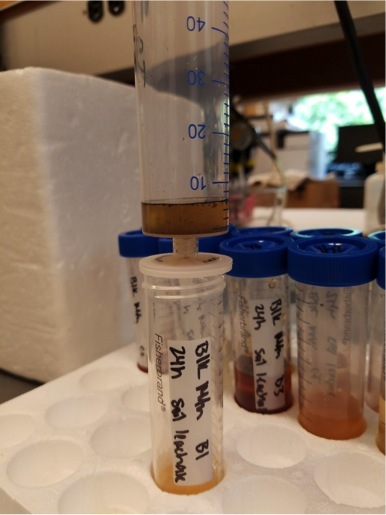 After the prescribed leach time, samples are centrifuged and filtered using a syringe fitted with a nylon filter to separate leachate (amber to red liquid above) from soil.